The City of Dunkirk Police Department is issuing the following safety reminders to everyone during the Thanksgiving Holiday. Please plan properly for trips by checking the weather and road conditions. Allow plenty of time to reach your destination, take frequent breaks while driving. Always wear seatbelts and please make sure children are in a child safety seat. It’s a proven fact that seatbelts and child safety seats save lives. Keep an emergency pack in the vehicle including blankets, water, snacks and a flashlight. Do not drive while texting or talking on your cell phone (except in case of an emergency). This is very distracting, dangerous and it is also illegal. We wish for everyone to enjoy the holiday with family and friends but if you have celebrated to much and can’t safely operate a vehicle please don’t. Designate a safe driver ahead of time. Please don’t create a tragedy as your remembrance of this holiday. True friends won’t let someone they love get behind the wheel or get into a vehicle with someone if they can’t safely operate it. If you encounter reckless operators do not confront them, pull off the road and call 911 with the description and direction of travel. Please keep an eye on what is going on in your Neighborhood. If you see or hear something out of the ordinary please call the Police Desk at 366-2266 or 911 and let us send an Officer to check it out. The Dunkirk Police Department wishes everyone a happy and safe Thanksgiving Holiday. The best way to honor our Veterans is by not forgetting what they have done for our Country, they fought to protect the rights of every American citizen each and every day. The Dunkirk Police Department is proud to honor our Veterans by participating in the greenlight a vet program. The light globes at the Fourth Street entrance to Police Headquarters have been changed to glow with green lights to show our support for Veterans. We want to show our respect and honor to all the Veteran members of our armed services who have served our Country in the past as well as those who currently serve in our armed forces today. We especially want to honor all those who paid the ultimate sacrifice and gave of their lives. The Dunkirk Police Department has Veterans currently serving in our Department and we have a long standing tradition of Veterans who have served the Department in the past and we are proud to honor them by participating. We encourage all our citizens to change one light in their home or on their front porch to green in honor of our Veterans and to keep that light glowing as a beacon of respect. May god bless our Veterans and may god bless all the men and women who are currently serving in our Armed Forces. 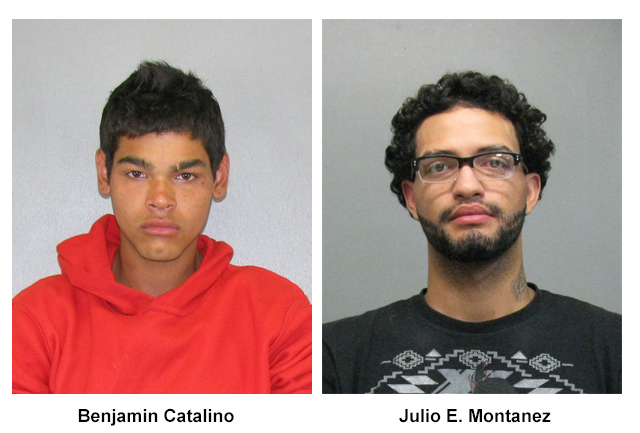 In the early morning hours of Sunday November 8th, 2015, at about 5:17 AM, the City of Dunkirk Police responded to Dollar General, located at 168 E. Fourth St. A citizen complaint received indicated that there were two suspicious male subjects in the area that may be attempting to burglarize the store. Upon arrival, two males were located in front of the store where one of the front windows had been broken out. Upon seeing patrol cars, the two males ran from Police in opposite directions. Both subjects were taken into custody after brief foot chases. Benjamin Catalino, age 19, of 12155 Angel Rd, Silver Creek and Julio E. Montanez, age 21, of 187 Lake Shore Dr E are charged with Attempted Burglary in the Third Degree a Class E Felony, Criminal Mischief in the Third Degree a Class E Felony and Obstruction of Governmental Administration in the Second Degree a Class A Misdemeanor. Both were arraigned in City Court and are being held in County Jail pending a preliminary hearing.